Weeks after opening its doors to the public, Wyvern House’s new Public Services Hub is already helping residents improve their lives. Karla McDonagh, 32, from the Mount Pleasant area of Winsford has had to cope with ‘struggling circumstances’ in recent years as she brings up her one year old son as a single mum without the security of having a job. Karla said: “When I was moving over from maternity pay to benefits I needed help with council tax and rent and I was sent to Wyvern House. It is now the go to place in Winsford. They ask you what you need and they point you in the right direction. “I think it’s a good thing now that it is all under one roof. There were times in the past when you came here and they said you needed to go to the Job Centre and then they would tell you to back go to Wyvern House and then off to the Work Zone. “You would constantly be back and forth to different places. It is very time-consuming and pretty tiring and daunting, even for the healthiest of people with healthy minds. If you have mental health problems you would find it difficult, you might be sent from one place to another and then not be bothered to attend because you’re not well. Residents can access a range of services which offer employment, housing, health and welfare reform support. They will be given help to prepare CVs, develop IT skills and apply for jobs. Karla added: “Now, there are a lot of services here like Citizens Advice and I have used that a few times for help. The service I have received has helped me massively and Wyvern House on a few occasions has helped me in struggling circumstances. Cllr Brian Clarke, Cabinet Member for Economic Development and Infrastructure, said: “Cheshire West and Chester Council is putting the views of Winsford people first and offering what they need. Residents walk into Wyvern House looking for help and support with all different types of problems and concerns and it is our job to ensure they are supported and helped to thrive. 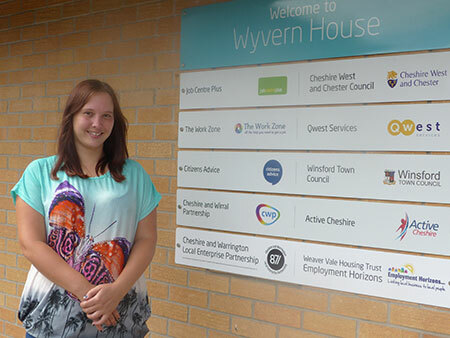 The improvements to Wyvern House are part of Cheshire West and Chester Council’s Winsford Whole Place Programme which is working to transform the lives of the people of Winsford so that they are able to thrive.